I came across this article that moved me. I usually don’t post anything political on this site, but this needed sharing. I think we make a big mistake if we bomb Syria. 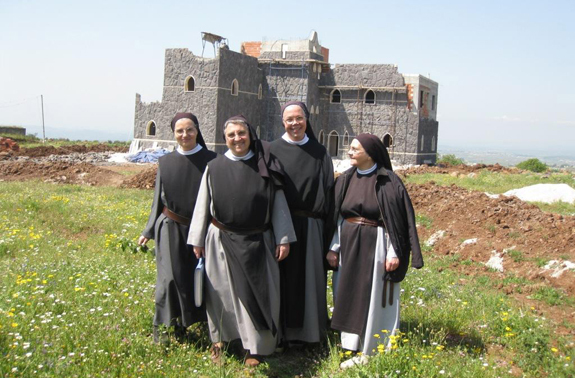 In March 2005 a small group of nuns from the Cistercian Monastery of Valserena in Tuscany moved to Aleppo, Syria, to found a new monastic community there. The nuns were inspired to take up the legacy of seven monks who were martyred in 1997 in Tibhirine, Algeria. The sisters wanted to follow the example set by these men, who had totally dedicated their lives to God and to their beloved Algerian neighbors, both Christian and Muslim. Once they had settled in Aleppo, with the blessing of both the Latin Apostolic Vicar and the Maronite bishop of Tartous, the sisters gained a new awareness of the importance of helping Christian Arabs remain in the Middle East, as well as a respect for the diversity of their traditions. Their project was, and continues to be, establishing a permanent monastery on the land they bought near the Syrian border with Lebanon, in a Maronite village named Azeir, atop a hill, far from the big cities. The monastery is at the service of isolated Christian communities, in a land which is predominantly Muslim but which is home to the most ancient of Christian traditions. To the sisters, Syria represents the meeting place of East and West, the place where Christianity began and then spread to Asia Minor, Greece, Rome, and then Armenia and India—all the way to China, with saints such as such as Afraate, Ephraim, Cyrus, Simeon Protostilite, Maron, Isaac of Niniveh, and others who followed in their footsteps, such as John Chrysostom and John Damascene. It is this tradition the sisters wish to honor and perpetuate, persevering in their mission despite the fear and the hardship: to keep the monastery going and provide those who desire it with a chance to spend a few days there, with a church to go to. These nuns have been providing a much-needed independent perspective on the tumultuous events going on inside Syria, in eye-witness reports published on their website and in the Italian bishops’ newspaper, Avvenire. Here is a translation of a letter written on the 29th of August, in which the sisters seem to be holding their breath as President Obama deliberated about what, if any, action would be taken in Syria by the United States. Rebuke the Beast of the Reeds, that herd of bulls, that people of calves…oh God, scatter the people who delight in war…Yahweh has leaned down from the heights of his sanctuary, has looked down from heaven to earth to listen to the sighing of the captive, and set free those condemned to death…Listen, God, to my voice as I plead, protect my life from fear of the enemy; hide me from the league of the wicked, from the gang of evil-doers. They sharpen their tongues like a sword, aim their arrow of poisonous abuse…They support each other in their evil designs, they discuss how to lay their snares. “Who will see us?” they say. He will do that, he who penetrates human nature to its depths, the depths of the heart…Break into song for my God, to the tambourine, sing in honor of the Lord, to the cymbal, let psalm and canticle mingle for him, extol his name, invoke it…For the Lord is a God who breaks battle-lines! … Lord, you are great, you are glorious, wonderfully strong, unconquerable. We look at the people around us, our day workers who are all here as if suspended, stunned: “They’ve decided to attack us.” Today we went to Tartous…we felt the anger, the helplessness, the inability to formulate a sense to all this: the people trying their best to work and to live normally. You see the farmers watering their land, parents buying notebooks for the schools that are about to begin, unknowing children asking for a toy or an ice cream…you see the poor, so many of them, trying to scrape together a few coins. The streets are full of the “inner” refugees of Syria, who have come from all over to the only area left that is still relatively liveable…. You see the beauty of these hills, the smile on people’s faces, the good-natured gaze of a boy who is about to join the army and gives us the two or three peanuts he has in his pocket as a token of “togetherness”…. And then you remember that they have decided to bomb us tomorrow. … Just like that. Because “it’s time to do something,” as it is worded in the statements of the important men, who will be sipping their tea tomorrow as they watch TV to see how effective their humanitarian intervention will be…. Will they make us breathe the toxic gases of the depots they hit, tomorrow, so as to punish us for the gases we have already breathed in? The people are straining their eyes and ears in front of the television: all they’re waiting for is a word from Obama! A word from Obama? Will the Nobel Peace Prize winner drop his sentence of war onto us? Despite all justice, all common sense, all mercy, all humility, all wisdom? The Pope has spoken up, patriarchs and bishops have spoken up, numberless witnesses have spoken up, analysts and people of experience have spoken up, even the opponents of the regime have spoken up…. Yet here we all are, waiting for just one word from the great Obama? And if it weren’t him, it would be someone else. It isn’t he who is “the great one,” it is the Evil One who these days is really acting up. And despite all our globalizations and sources of information, it seems nothing can be verified. It seems that there is no such thing as a minimal scrap of truth … That is, they don’t want there to be any truth; while actually a truth does exist, and anyone honest would be able to find it, if they truly sought it out together, if they weren’t prevented by those who are in the service of other interests. There is something wrong, and it is something very serious…because the consequences will be wrought on the lives of an entire population…it is in the blood that fills our streets, our eyes, our hearts. As Christians we can at least offer all this up to the mercy of God, unite it to the blood of Christ, which carries out the redemption of the world in all those who suffer. They are trying to kill hope, but we must hold on to it with all our might. To those who truly have a heart for Syria (for mankind, for truth…) we ask for prayer…abounding, heartfelt, courageous prayer.